We recently needed to access a small building on part of our land and we needed to excavate inside the building to put some new foundations in. The doorway was very narrow and there was no other access to the building. We needed a serious excavator to get the depth for the foundations, we knew we needed to hire a Mini Digger so we started to look for companies that provided mini digger hire in and around London. We came across a company called UK Diggers which provide mini digger hire in and around London, we have to say, they were extremely efficient and provided us with the smallest mini digger in their range, the Bobcat E10 mini digger hire. The cost of the mini excavator was reasonable and they delivered the digger to site for us with very little notice, the service was excellent and the machine gave us no trouble at all, we would easily recommend UK Diggers if you need to hire a mini digger. JPM Contractors Ltd pride themselves on service, reliability and professionalism when it comes to Operated Road Sweeper Hire, therefore we are very proud to announce our entry onto the list of Approved Johnston Operated Road Sweeper Hire Companies. The entry onto this list of companies that are approved by the manufacturer of the most reliable road sweepers in the UK is based on the constant maintenance of our fleet of road sweepers using only genuine parts from Johnston Sweepers. Using the original parts for the maintenance of our road sweeper fleet is just another step in our no compromise commitment towards complete customer satisfaction. We work with the majority of road maintenance and tarmac crews in the UK and they have come to rely on our road sweepers to keep their projects running on time and within budget. Working on the busiest roads and streets in and around London means that our vehicles must be kept running in tip top condition and we feel that this is best achieved by using original parts from the makers of the road sweeper. 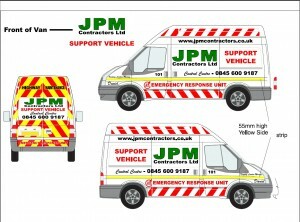 JPM Contractors Ltd the name you can trust for road sweeper hire. FORS is a funded, voluntary certification scheme aimed at ensuring that fleet operators work lawfully and to best practice by meeting the FORS standard. FORS can help you to stand out from the crowd and prove to current and prospective customers that you work to standards above the legal minimum. FORS also gives you access to a range of exclusive benefits that offer real competitive advantage. JPM Contractors Ltd are extremely proud to have achieved the FORS registration for our fleet of Road Sweeper Hire Machines. We believe this further enhances our commitment to Health & Safety. JPM Contractors Ltd take road safety very seriously and we are committed to the safety of vulnerable road user such as cyclists. With the growing number of cyclists using the roads of London, there is a growing challenge to ensure their safety in conjunction with other road users. In recent years there have been a number of high profile incidents involving both cyclists and HGVs that have resulted in a cyclist fatality. However, in recent years there has been a growing availability of technology that can be deployed by HGV operators to help their fleets and drivers to detect cyclists whilst on the road and therefore better prevent the likelihood of any cycling related incidents. This technology can also help other vulnerable road users, such as pedestrians, who may be unsighted from the driver’s cab. Secondary benefits of cycle safety technology include, less damage to vehicles, less time utilised dealing with the aftermath of an incident, lower insurance premiums and enhanced driver confidence. JPM Contractors Ltd provide operated road sweeper hire nationwide, although we do have a very heavy presence in and around London which is where we specialise. Our fleet of Johnston VT650 and 600 truck mounted road sweepers operate within the Low Emission Zone in the London area and are adequately equipped to deal with the challenges of inner city roads, building sites, airports, car parks and alike. Our operators have been supplying road sweeper hire in London for many years and are able to keep your job running on time with their knowledge of the London roads. We have vast experience working with the majority of the major Tarmac and Surfacing crews in and around the London area which brings some unique challenges to ensure the operations are kept moving smoothly. 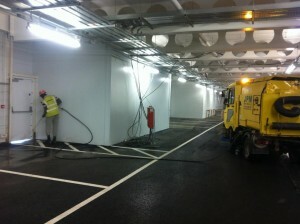 All of our operators have knowledge of the London roads enabling a prompt arrival at site. This knowledge is coupled with a deep understanding of what is required by Tarmac crews in terms of being ready to move when the conditions are right and getting the job done first time around. This is vital when dealing with busy London Roads. Our Road Sweeper Hire London operating crews are acutely aware of the pressures on confined building sites in the Greater London area and our expertise comes in to play when the need to keep the surround streets and roads clear from the intrusion of the vehicle and swept clean and thoroughly reducing the risks of accidents from roads that are heavily soiled by traffic coming and going from the building site. Due to our central location and the large fleet of road sweepers we are able to offer our customers and contractors an arrival time and short visits to their sites from as little as 1 hour on site. This can be of great benefit to site managers needing to prioritise the movement of vehicles around the site. We are also able to offer full day’s of coverage on site from the early hours of the morning to the late evenings. Our rates for operated road sweeper hire in and around the greater London area are among the most competitive in the industry and in some cases of comparison up to 50% better than the the competition. So, if you are looking for a solution to the need to have your roads and streets around any of your construction projects in London you need look no further than JPM Contractors Ltd.
Our logistic capability to supply road sweeper hire in London is second to none, we are also able to supply road sweepers nationwide from our other distribution yards around the midlands. 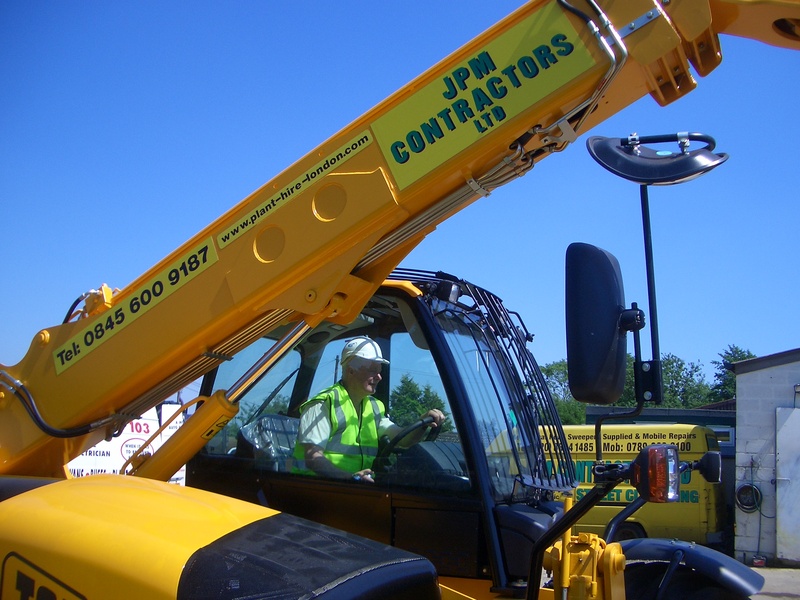 What some of you regulars may not be aware of is the other aspects of the business which can supply any type of plant equipment such as telehandlers. Just an example of a telehandler in operation. We have recently changed the look and feel of our Emergency Response Vehicles in an effort to freshen up the image and create cross brand awareness. The identification of our support vehicles is important for gaining access to sensitive construction site areas and allowing the speedy response that we guarantee our customers. Another benefit of the high impact graphics is to allow for hazard awareness on Motorways and when working with tarmac crews on very busy, live roads. 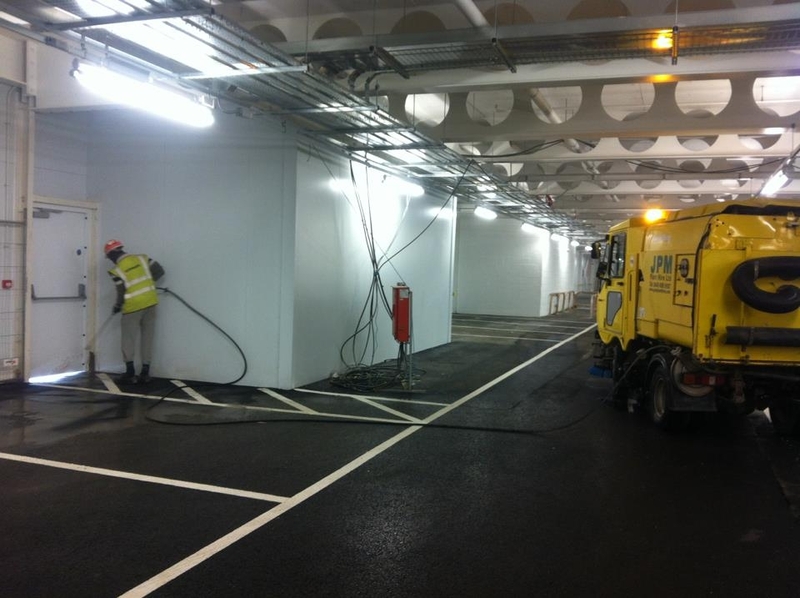 On the rare occasions that our support vehicles are called out to remedy any issues that the fleet of operated road sweepers may encounter, it’s important that our support vehicles are both easily identified and highly visible to allow the smooth operation of the current project to continue with little or no interruption. This is a further commitment toward our 100% safety record over the last ten years of which we are rightly very proud. JPM Contractors Ltd Operated Road Sweeper Hire. Why spend more on toilet paper than you need to, we were paying silly prices for our toilet roll and hand towels until we came across this company. They also offer late night deliveries in and around London and the Home Counties which is a great help if you have late night operations. We have been using Save On Supplies for quite some time now and their products are really good quality and great value. JPM Contractors Ltd are proud to announce the securing of a new contract with Watford Borough Council to provide a road sweeper for the streets of Watford. The Johnston VT650 Road Sweeper and operator will be tasked with the removal of the autumn leafs that have, and will be falling on the roads of the Watford Borough between now and winter. Fallen leafs on roads can present a a real hazard for all types of road users making this contract and the provision of the road sweeper and operator a big responsibility which we as a company are happy to accept. A unique selling point for this contract was the ability to supply the same operator and 24 hr service backup to ensure continuity of service for the client and to maximise the road sweeper hire potential. We feel that this contract further endorses the capabilities of JPM in the provision of Road Sweeper Hire in and around the Greater London Area to accommodate the requirements of our varied clients. If you need a road sweeper for building site, school, club, retail outlet, council, golf club, tarmac, highway maintenance, muck away, yard or just general street sweeper we have a solution to suit your needs. If you need road sweeper hire in and around the London area, check our postcode coverage by clicking the link on the Road Sweeper Hire London.